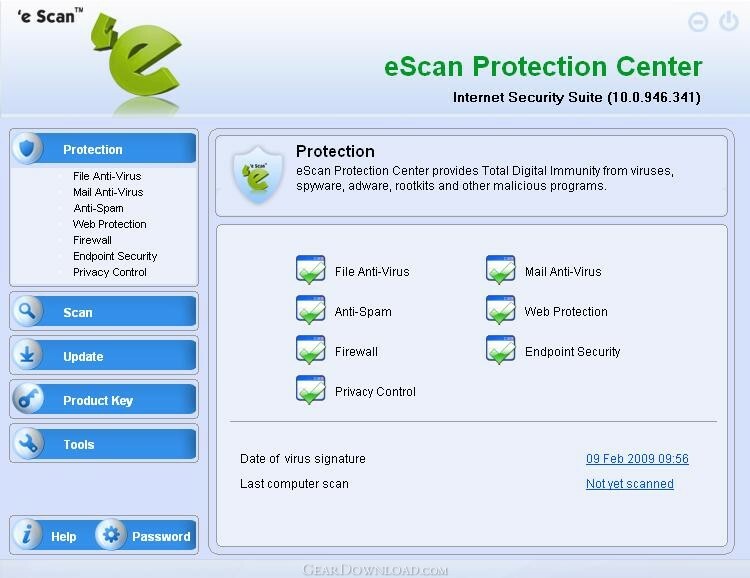 eScan Internet Security Suite - Effective against virus, spyware, adware, keylogger. eScan 11 Internet Security Suite presents a trendy, dock-based graphical interface that is very user-friendly and is specially designed to suit the emerging technology trends. The new On-Demand Scanner is equipped with Whitelisting Technology that leads to faster scans and is very light on system resources ensuring that your computer does not slow down, even while eScan is performing thorough system scans. It not only offers effective Real-time Protection to all the Files & Folders Residing in your Computer, but includes enhanced Self Protection Technology that prevents new generation malware from either disabling eScan or deleting its critical files, thus keeping your computer safe from infections. Now you can also enjoy an uninterrupted gaming experience, as its gaming mode blocks notifications and alerts, while you play your favorite games. eScan 11 Internet Security Suite includes the Laptop Mode feature that provides unmitigated battery time on laptops. It includes a set of predefined access control rules that you can customize as per your requirements. It controls spam effectively by using Artificial Intelligence and sophisticated filters that work on the basis of specific keywords and phrases. This technology uses Artificial Intelligence to learn your behavior pattern and classifies e-mails as Ham (E-mails received by user) or Spam (E-mails quarantined for user). eScan 11 Internet Security Suite helps to perform static asset management by using the System Information tool. It now has advanced Web Phishing Filter that warns you of Phishing Web Sites. It is also equipped with a Virtual Keyboard to protect your system against keyloggers. You can use this keyboard while typing sensitive information, such as banking passwords or credit card numbers. On the whole, ensure that your online transaction processing and data lie in safe hands with new eScan 11. New "MWAV (MicroWorld AntiVirus) Utility"
This download (iwn2k3ek.exe) was tested thoroughly and was found 100% clean. Click "Report Spyware" link on the top if you found this software contains any form of malware, including but not limited to: spyware, viruses, trojans and backdoors. MailScan for Mail Server 6.8a Version 6.8a - The world's advanced email scanner for Mail Server. MailScan for SMTP Servers 6.8a Version 6.8a - MailScan for SMTP Server is the advanced Real-time Anti-Virus and Anti-Spam. eScan Corporate for MailScan 11.x - An Antivirus & Content-Security solution for Workstations & File-Servers. eScan AntiVirus Edition 11.x - eScan for Windows provides security for desktops & protection against viruses. eScan Internet Security Suite with Rescue Disk 11.x - Effective against virus, spyware, adware, keylogger.